This is true immersion. These are the places tourist guides miss, more historically ‘real’ than many of the ‘in’ tourist hotspots in Tuscany. Of course out in the dense Tuscan woods, we are far less affected by tourism too. Here we can stop our horses and take a moment to enjoy the scenery around us. A castle that was built over a thousands years ago, lies in ruins nearby. Overgrown with vines and looking not unlike a forgotten Mayan ruin. This place is older than most can comprehend, and full of nooks and crannies that one would love to explore in better detail. Above us looms the shadow of Volterra, of recent twilight fame. Riding on through soft dirt trails that allow for short bursts of canter into open fields (often surprising deer and foxes). The area is home to a wide selection of wild animals, including the elusive Appenine wolf, though they are far too smart to let themselves be seen during the daylight hours. I imagine romantically that perhaps they are watching me; looking out from a safe den in the mountains that look down over us. We ride out of the forest to a cultivated field of grain. Riding onwards a farmer is pruning his olive trees on a faded yellow ladder. He stops and watches us as we pass our horses below him. Tuscany has always been famous for its wines, its art galleries and its wonderful cucina povera. The forested and hauntingly lovely Val d’Elsa is home to some spectacular ruins: Vignale, medieval castle abandoned after WWII; Castelfalfi, an ancient Long Bard settlement, soon to become one of Europes largest resorts; San Vivaldo, Monastery and Pilgrimage route built 400 years ago, Cafaldo a mysterious natural spring located at the bottom of a shadowy canyon and on and on. This forest was once filled with bandits and thieves – so much so, that all of the castles during medieval times were forced to build high walls to protect their inhabitants. In more recent years, it was home to the infamous Banda dello Zoppo. A team of antifascists that took to the woods in the 1920’s after a shootout in nearby Certaldo. The leader of this group was lame, hence the name ‘Il zoppo’, and together this group became legendary in the area for their skills at outsmarting the local police (even when il zoppo was finally caught and sent to prison in Volterra, he escaped and was never re-aprehended) but also because the group helped locals, and held up only the rich facist leaders. 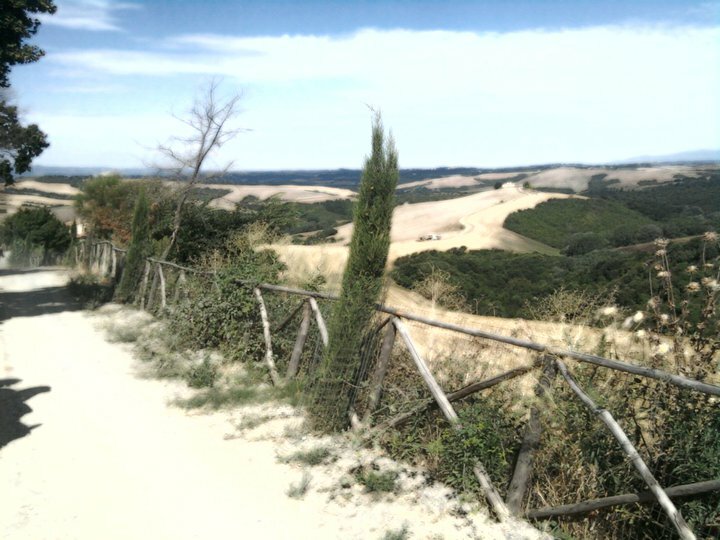 Riding through the countryside out here, the Tuscan badlands so to speak – one can almost imagine what it would have been like to live as outlaws hundreds or thousands of years ago. It is only by horseback (or for the very fit, by foot) that one can experience this very unique Italy. Horses negotiate the terrain superbly, and one can travel up to 30km comfortably in a day. We stop at San Vivaldo for a gelato on the way home, and the horses are watered. Hot and sweaty, this type of tourism isnt for everyone, but at the end of the ride. With an ice cold beer, and a happily watered and fed horse – who wants the air-conditioned tour bus anyway! Montaione is an ancient medieval village in the heart of Tuscany. The area around Montaione was once covered in water, with only the mountain behind Iano poking his head above the seas. For this reason, the land around Castelfalfi and Tonda is full of sea fossils. Riding through Castelfalfi two weeks ago with the wonderful company of two scientists and their adult children, the father pointed out how many fossils he could see in the dirt under our feet. He joked that as a scientist it was hard for him to not leap off the horse and start digging, as these were old fossils – and interested him immensely. In our trainers office is a large completely intact shell found out on the trails, and many of our friends in the area have wonderful examples that they themselves have found whilst out walking or riding. The most impressive fossil found so far was dug up in the 1980’s and can be viewed at the museum in Montaione. The fossil is that of a prehistoric whale ‘Balaena Montalionis’ which lived around 3.5 million years ago. This fossil was found in Castelfalfi, only a 15 minute ride from our stables. The area is also home to relics of a more recent nature – said with tounge in cheek, as the earliest human civilization evidence starts with the Etruscans (2000+ years ago). The Etruscans populated Tuscany thousands of years ago. Volterra, which can be seen from Tonda, was in Etruscan times called Velathri and was one of the 12 cities of the Etruscan confederation.Today their is a great museum full of Etruscan artifacts inside the town as well as a series of underground tombs that can be visited free of charge outside ‘Diana’s Gate’ (which is also of Etruscan origin). Horses were important to the Etruscans, and their tombs and vases were often decorated with images of beautiful strong equines, pulling chariots, or carrying soldiers. Their is still very little known about the Etruscan people, as after the civilization fell to the Romans, they were periodically exterminated – and the language soon died out. Their language has also been the hardest to decipher of all the ancient languages (such as Akkadian, Babylonian, Mycenaean and Egyptian). 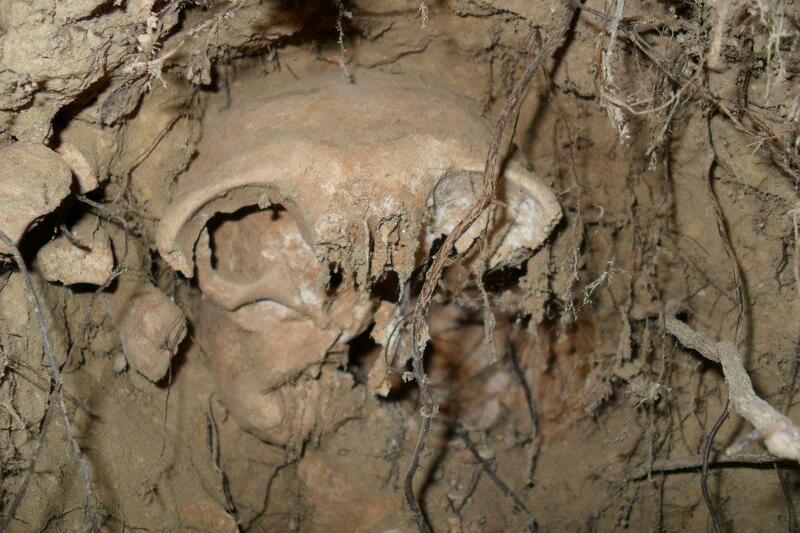 What we do know is mainly due to what has been left behind in their tombs and from Greek texts. The Etruscan horses were known to have been some of the best in Europe -as well as the fastest. The forms depicted in tombs are far from stumpy short legged ponies – but rather elegant, muscled and well formed racehorses. Today, riding through the area, we are riding on the same land that the Etruscans kept their horses thousands of years ago . For those that love both golf and horseriding in Tuscany The 27 hole Castelfalfi Golf Complex is right next to the Castellare di Tonda estate.This is the newest and largest golf course in Tuscany. The two golf courses are set in 1,100 ha of rolling countryside. The original course, which was over 20 years old and was originally designed by Mancinelli, needed to be remodelled and was completely redesigned and brought up to modern standards. This course offers a fantastic alternative to riding for couples that share different interests. Golfers can hire everything at Castelfalfi, and also enjoy professional lessons by the on site instructor. When is the best time to visit Tuscany for a horse riding holiday? The ultimate horse riding vacation in Tuscany would be in the Autumn and Spring, when the weather sits around 20 -25 degrees during the day, and cools down in the evenings. Horse riding in Tuscany during the annual grape harvest which starts in late August and runs through September is a special experience not to be missed, and a wonderful way to learn about Tuscan food and wine culture. The hillsides at this time of the year are beautiful- cloaked with green vines, that contrast interestingly with the ochre soil that they grown upon. Their is an exciting vibe in the air, as the harvest workers pick the grapes, chatting and singing. At the end of the day Tractors pull the huge loads of ripe grapes down all of the country lanes. They drip grape juice, staining the roads and leaving a wonderful smell of fermenting grapes. This is a difficult time to organize wine tasting at the cellars, as all of the staff will be out in the fields working hard to get the harvest in. The hot summer this year which has left the fields dry and parched, and the farmers desperate.. does have a good side. Great wine. The 2012 wines should be great says the wine maker here at Castellare, as lots of sun makes for an excellent Chianti. Why should you choose Tuscany for a horse riding holiday when there are spectacular horse riding holiday destinations all over the world? 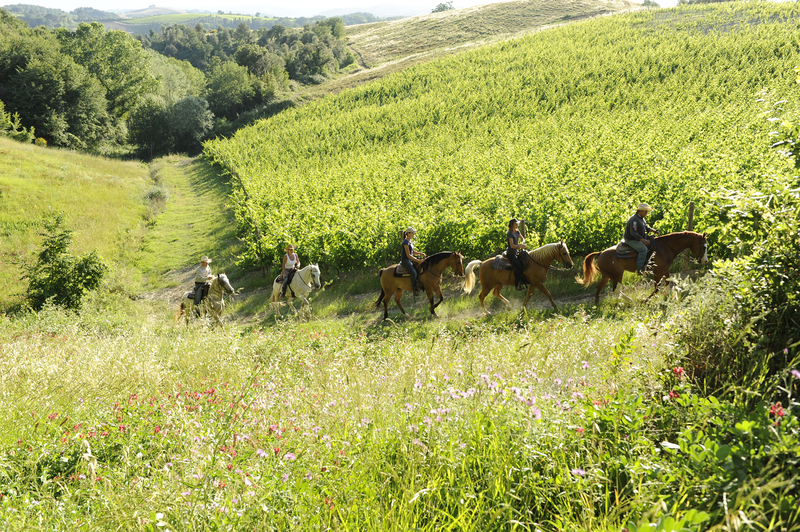 Here are five reasons to go horse riding in the Chianti wine making region of Tuscany, Italy. Tuscany offers a wealth of unique local flavors for the equestrian traveler. 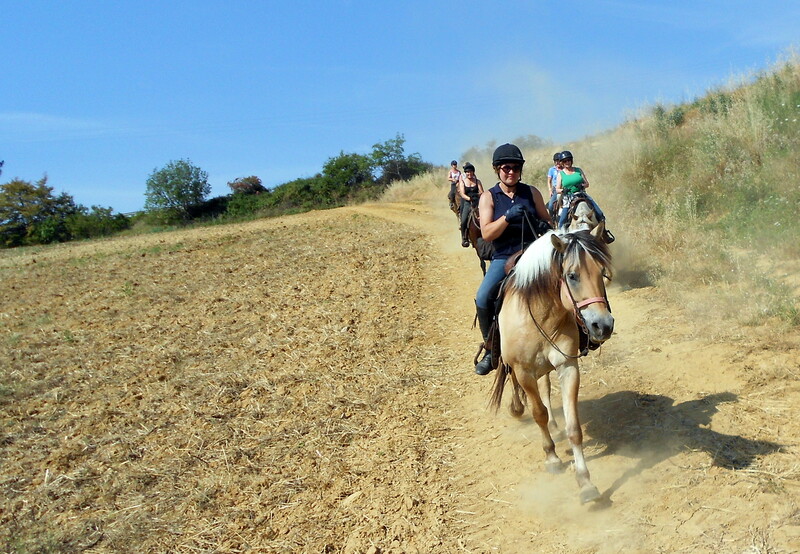 Horse riding in Tuscany is a unique experience due to the historical importance of many of the locations visited on each trail. Horses have been used in Italy for transportation for thousands of years, and many of the trails a tourist will ride along, were the same trails used by Roman soldiers and Medieval pilgrims. Reason 1. Distinct and beautiful countryside. Tuscany is known internationally for its cultivated vineyards and olive groves – but the region is also full of wild forests, thermal pools, magnificent ruins, and an excellent network of riding trails. It is possible to experience very different riding each day in Tuscany, and to visit historical sites such as old ruins, that are only accessible by foot or horseback. 2.Different breeds of horse/styles of riding. Italy has a long and interesting equine culture that dates back to the Etruscan times. Horses remain an important element of modern rural living- especially in Tuscany, where the Italian cowboys ‘The Butteri’ still work cattle in the Maremma, here,it is possible to ride a Maremmano horse in a scafada saddle (a special saddle that has been used for centuries by the Tuscan cowboys). Western riding is also popular in Italy. 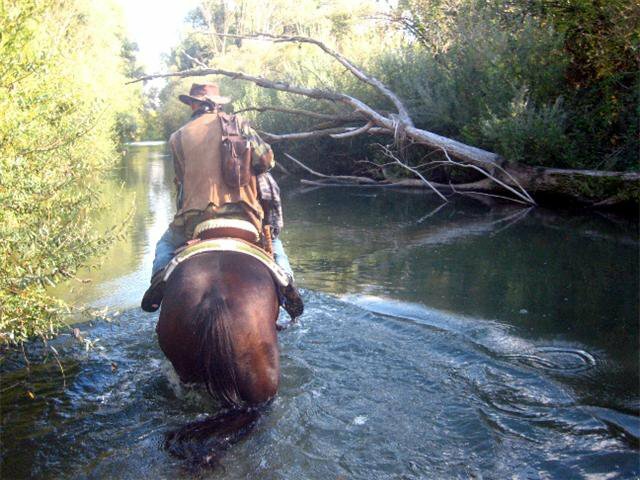 English riders should not be daunted by western tack on a riding holiday, the saddles offer exceptional comfort and security for both horse and rider, and the different style can be quickly picked up after a short explanation before heading out on the trail. Italian has many interesting horse breeds that are rare outside their native land. Many of these breeds are actively working in equine tourism. You may find Maremmano horses, Bardigiano ponies, Haflingers, Norik horses or Murgese horses in many of the riding centers through Tuscany. Reason 3. Chianti and Brunello wine. Nothing beats drinking locally produced wine – especially when those wines happen to be two of the best known in the world. Tuscany abounds with wineries that offer guided tastings of their cellars, and many places that you stay will offer wine tastings of their own produce free of charge. You can enjoy wine tasting rides, where the guide will take a group of riders to visit a local winery – or enjoy a selection of top rated wineries with a driver inbetween riding days. NB:Castellare di Tonda produces four different wines (Chianti and a white wine variety called Solaria) and a Grappa (distilled from the grapes and with a strong aromatic taste). Italy is a popular tourist destination because of the reliability of the weather. Here Summer is hot! If you are a sun-lover, then you can be guaranteed a hefty dose of vitamin D during your vacation. The best months for riding are usually May and June, and September and October – though if you are happy to rise early, or ride later – then the summer months of July and August are also lovely. The shoulder seasons offer a slightly milder riding temperature, with sunny days and cooler evenings. Italian cuisine is famous all over the world – and it is a difficult to find a bad meal in rural Tuscany, where food is taken very seriously! Meals served in restaurants and agriturismo’s are usually sourced locally, and the menu is also highly seasonal – meaning only fresh produce is used. After a long days horse riding, a good meal is not just welcomed…it is necessary! Social Tuscan picnic lunches, served on the manicured grounds of a monastery, or underneath a shady tree with a panoramic view, are a great way to get to know fellow riders from all over the world.